A panel of independent scientists have told two sides of a long and often bitter scientific debate over how to help migrating juvenile salmon make their way to the Pacific that they are both right. The Independent Science Advisory Board released its report late Friday saying the federal government should continue the strategy of barging some salmon through the dams while allowing others to spill over the dam spillways. "From a scientific standpoint, a mixed strategy for spill and transport is best supported by the available science," the panel, appointed by the Northwest Power and Conservation Council, said. The National Marine Fisheries Service had proposed to barge as many fish as it could capture because it expects a low water year and its scientists say barging is better. Scientists for the Fish Passage Center, Oregon and other groups say spilling is better. At its heart it is a debate between brilliant fisheries biologists that all are seeking to preserve Columbia and Snake river salmon and steelhead. It is a debate that once lied at the heart of the salmon and dam debate. When no one was seriously considering removing four dams on the lower Snake the debate about their survival was whether the barging transportation system developed in the 1970s and 1980s to carry the smolts through the dams to the Pacific, was the solution. Teams of scientists from the National Marine Fisheries Service and the U.S. Army Corps of Engineers had developed the collection and transportation system because they knew that in the river a percentage of the young salmon died at each dam, about 15 percent. Cumulatively, this was agreed by everyone to be the major limiting factor for those salmon that had to go through more dams, like those in Idaho. 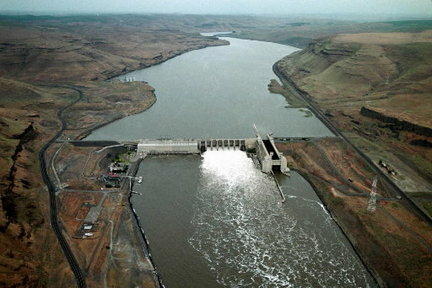 Since the barges could get more than 95 percent of the young salmon down to the estuary below the first dam, Bonneville, it was considered a success. But state biologists began seeing that a higher percentage of the lower number of salmon that remained in the river actually returned to spawn than of the salmon that were barged. And they observed that the mortality for both barged and "in-river" fish came after the salmon entered the estuary in the Columbia. This "delayed mortality" was the major argument of scientists in the 1990s. State and tribal biologists argued that because so many salmon died after the migration, because of the impacts of the dams and the barging effects on the ability of freshwater salmon to turn into sea fish and find their way home, the salmon in the upper river like Idaho may not be able to survive. In the late 1990s, after many independent reviews, most scientists on both sides of the debate acknowledged that putting salmon in barges could only be viewed as a temporary measure. Salmon are their environment and there has been plenty of evidence that hatching in hatcheries and being carried in barges to the ocean was changing salmon in ways that was not good for its long term survival. These conclusions have prompted federal dam managers to develop a more effective system for getting salmon through the spillways. These fish slides do reduce "in-river" mortality. The fish slides also allow federal managers to reduce the amount of spill, which diverts the water way from the hydroelectric generators that pay for almost all the salmon conservation. The new scientific view also has prompted federal agencies to focus on improving the habitat in the Columbia estuary, where its scientists believe much of the "delayed mortality" happens. Pressed by U.S. District Judge James Redden, federal officials have continued to spill more water away from the generators than their scientists believe is necessary. This "spread the risk" strategy costs tens of millions of dollars in hydroelectric power revenues. Armed with its scientists' conclusions, the federal government has proposed barging more and spilling less. Environmentalists, fishermen and Oregon balked as did their scientists. So the ISAB was brought in 2008 to review the science. It said: "Whenever river conditions allow during the late April-May period, a strategy allowing for concurrent transportation and spill is prudent." So the ISAB was asked to look at updated science again this year. "The question of whether "river conditions allow" must necessarily involve a wide variety of other considerations," the panel wrote." Among these considerations are projected power requirements and water demands, which are beyond the legitimate purview of the ISAB. "From the standpoint of protecting the region's biotic resources, however, the ISAB's assessment of scientific data, references, and analyses that were reviewed leads us to the same conclusion as expressed in our previous review." So now a federal judge will have to decide whether to continue the "spread the risk" strategy or go with the federal scientists plan for more barging. Both sides believe their science is sound and that they are putting science first. But the federal dam managers get a lot of power revenue if they follow their scientists. And environmentalists, fishermen and others pushing for the painful measures they think are necessary to save the fish will have kept that reward out of the region's pockets so they would consider dam breaching, if they get what their scientists say.